Captain America: The Winter Soldier Giveaway! 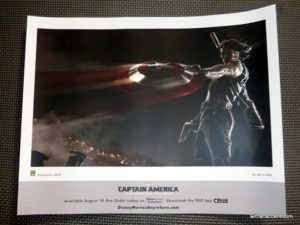 In honor of todays release of Captain America: The Winter Soldier on Blu-ray, DVD, and all those other platforms, we’re passing on a fun little piece we collected at SDCC this year – an SDCC Exclusive lithograph of The Winter Soldier. You have until Tuesday, 23rd September at 8pm PT to enter when we’ll randomly select our winners. * Because of the prohibitive cost of shipping abroad, we regret that this contest is only available to participants in the United States. I follow you on Twitter (username – Serena6504) and on Google Plus (Serena Powell) and have retweeted and +1 the post.